In Bohemia, historical fact and story-legends have become interwoven through the mists of time. Every small village and large town has a story or two to tell. These tales implore the listener to suspend his or her belief but with-in these tales lay, in part, actual truth. Click here to find out more about the regions of the Czech Republic through her collective "tall tales". 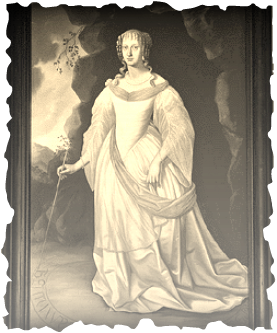 Her name was Perchta von Rosenberg, and had lived a difficult life following her arranged marriage to Jan von Lichtenstein, thus joining two very powerful families. Jan von Lichtenstein was a widower and when Perchta moved to the Lichtenstein castle, she was harassed daily by the mother and sister of her husband's late wife. Yet, Perchta did her duty and suffered through a bad marriage at the hands of an abusive husband. Upon his death, she was free to return to her family at the castle in Cesky Krumlov. Though she was free from this hellish marriage, the years wore on her and she never smiled again. She was a kind woman that offered to care for the poor and help in their needs. When she died at the age of 49, many wept for her memory. But this is not where the story ends.....it is said her ghost lives on! Her ghostly figure, draped in a white gown, has been seen in various castles owned by the Rosenberg family. This includes the castle in Cesky Krumlov. Her ghost is a kindly one yet still disconcerting to the living. Long ago when the Czech lands were ruled by Prince Křesomysl, a humble farmer named Horymír lived in the village of Neumětely. Horymir had a white horse called Šemík. The Prince of the Czech lands had a passion for finding treasure said to be hidden deep under the surface of the land. Many of the farmers were encouraged to give up their trade and pursue mining. Horymír was unhappy with Křesomysl's rule and warned that neglecting farming would result in famine. Horymir's viewpoint isolated him from his peers and a group of angry miners set his house and property on fire. In a reprisal for this burning, Horymír's followers burned down the miners' village. Horymír was punished and sentenced for execution. Horymir was granted one last wish before execution. He requested one last ride around the castle grounds on his beloved horse Šemík. His wish was granted. When Horymír got on his white horse, he whispered something in his ear. No one knows what was said to his horse but the result was a quick action! Šemík ran to the ramparts, jumped over them and slid down the cliff. 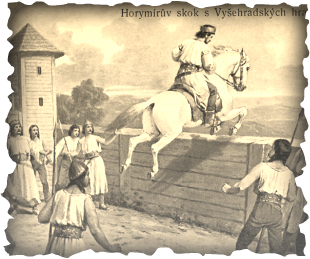 When the on-lookers got to the ramparts, they were astonished to see Horymír and Šemík on the other side of the Vltava, galloping towards Neumětely. The miraculous jump exhausted Šemík. The horse soon died from this dramatic escape and was buried with honour. Šemík, the gallant horse, is said to be sleeping in the Vyšehrad rock, ready to come out when his help is needed again. There once lived a wealthy man named Myslík who was forced to flee from his home in Prague following the battle of the White Mountain. In order to hide is riches, he melted all his silver into shape of a fish from a clay mold. 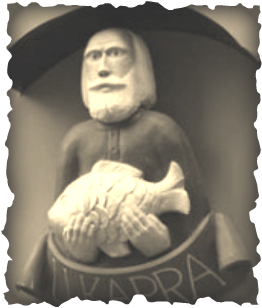 Before leaving Prague, Myslík hid his silver fish inside a wall of his house. Many years later a new tenant was living in that house. One day, the new owner was ordered by Prague's magistrate to tear down the old building and build a new one. The poor man fell into despair at the news as he didn't have the money to obey the ruling. He was about to leave his house when Myslík's silver fish fell out of a broken wall. The "silver fish" allowed the man to restore his old house. This legend rests at the heart of the founding of Prague and the Czech people. 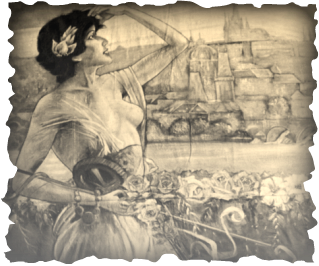 The origin of Prague goes back to the 7th century and the Slavic princess Libuše, a woman of great beauty and wisdom who possessed prophetic powers. 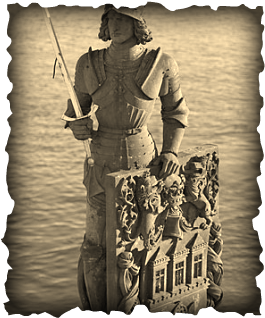 Libuše married a simple plowman by the name of Přemysl and they ruled peacefully over the Czech lands from the hill of Vyšehrad. "I see a great city whose glory will touch the stars". She told her people to go and build a castle where a man was building the threshold of a house. The czech word for "threshold" is where Praha received it's name....."And because even the great noblemen must bow low before a threshold, you shall give it the name Praha". The Premyslid dynasty would rule for hundreds of years and the city of Praha would survive many perils as a beautiful city on the hill. Libuse vision holds true to this very day. Similar to Homer's Iliad and the Odyssey, the tale of Bruncvik is one of long wanderings, adventures in far off lands, and an eventual return home. 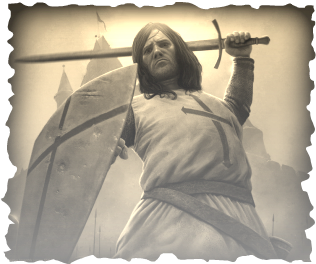 The Headless Templar is a legend repeated in several cities and towns across the Czech Republic but the main legend centers on the streets of Prague near the Ungelt.